At your service: Polished fasteners – and a ‘Tigger’ for the road! After investing in a CNC capstan lathe, Meriden Off Road of Brierley Hill, West Midlands, is now making a wide range of its own high-quality stainless steel fastenings for Triumph Tiger Cubs – and proprietor Chris Davies now plans to produce a ‘look-alike’ road-going version of his ‘world’s fastest Tigger’ sprint machine, writes Pete Kelly. The idea of visiting Chris Davies at Meriden Off Road on Monday, October 23 was to have a look at the Emi-Mec (EMI Mechanical) CNC (computer numerical control) capstan lathe that he recently bought in order to manufacture his own high-quality stainless steel nuts and bolts for Triumph Tiger Cubs – but I came away with the exciting news that he plans to build a road-going version of his ‘Tigger’ sprint machine that’s been featured in recent issues of OBM. 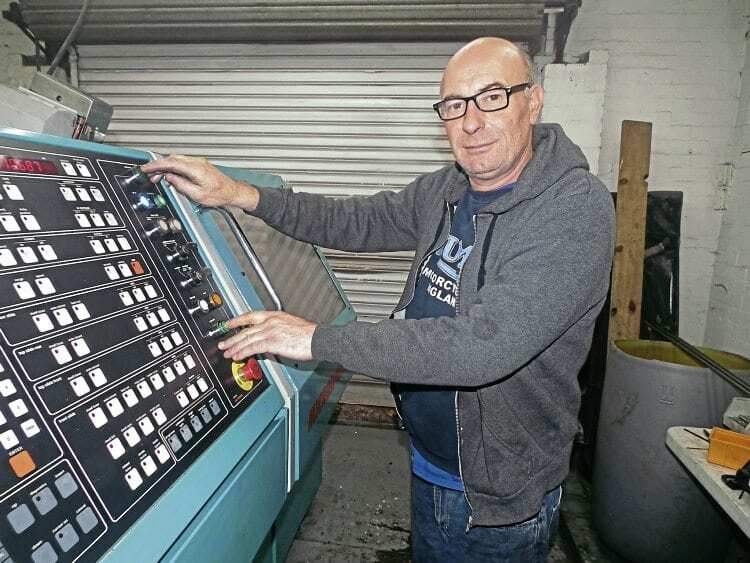 Chris Davies resets the controls on the Emi-Mec CNC capstan lathe that is enabling him to produce his own high-quality stainless steel nuts and bolts for the Triumph Tiger Cubs that make up the bulk of Meriden Off Road’s business. Making nuts and bolts to a high standard is never going to be cheap when you take into account the cost of the three-metre lengths of top-grade stainless round and hexagon bar, the Coventry die heads that each take four thread chasers, electricity at £10 an hour and the amount of setting-up time involved, and Chris has already discovered that the minimum number worth doing of any item is 200. Lots of development work has already gone into Chris’s little ‘Tigger’ Triumph Tiger Cub sprint bike, which he still has to run on concrete or hard Tarmac. Working on his own, he has to split his time equally between engine and bike rebuilding and the manufacture of the vital nuts and bolts, although once the Emi-Mec has been set up, he can leave it running happily until fresh lengths of stainless bar have to be inserted. 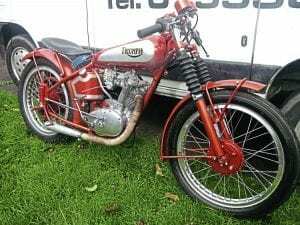 He’s now making all Cub fasteners including petrol tank bolts, seat mounting bolts, engine bolts, cylinder head nuts, stator/rotor nuts, wheel nuts, fork leg bolt nuts, mudguard bolts and many more. Read more in November’s OBM – on sale now!